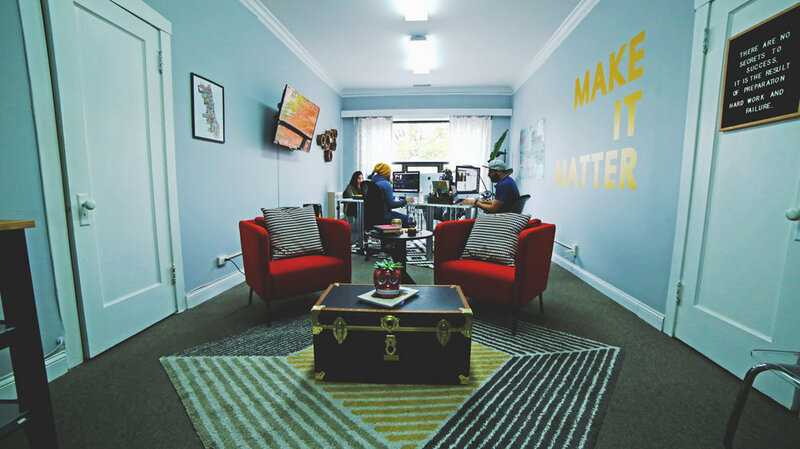 Eight months have passed since we moved into our new office space in Oak Park. Over this time, we have been adding our personal touch to the space. New paint, new furniture, and new wall art to cozy up the place. Our latest wall art, a decal: “Make it Matter” was our latest addition, and it had us thinking: how do WE make it matter? Before moving into our office space, we worked separately - all from our homes and occasionally in the Ravenswood office. We lacked the sense of teamwork by not working ‘together’, and to be honest, it’s tough to be 100% disciplined at home. Our work was still strong, but we felt fragmented. Since moving into the space, we’ve set our daily routines to overlap with one another. We’ve become more tight knit, more of a family, and our work has greatly benefited. We could have stayed the course, but this new dynamic of direct collaboration with one another has made all the difference. Our weekly “pow-wow” meetings of going over the week’s shoots, talking everything over attentively, has also made a big difference to make sure we’re all on the same page. Culture matters. It’s easy to say that someones passion is being creative. For us, we have to live it and breathe it - everyday. It’s our line of work. However, it’s very easy for creatives to hit walls. It’s important to us that when we’re struggling, to take a break and talk with one another. In order to make beautiful and engaging videos, this is important, and also important to keep that passion growing and healthy. Feedback matters. For us, learning and finding new inspiration is a big part of our weekly routine. How can we expand our skills and offerings? We all try to make it a point to keep each other accountable on learning something new and expanding our skillset. This is important for any small company to grow, in our opinion. Growth — both as a team and individually — matter. So what do we do to keep us motivated and in-tune? We all have our own ways. Whether its watching a new documentary, exploring new photography trends, or even trying new foods, we try to bring it home and let it inspire our work somehow. Here's our current list of what we've been listening to/watching/doing the last couple weeks to get those creative juices flowing! Philipe // This podcast by Patrick Lencioni—"The Ideal Team Player". Great insight into team dynamics and how to be an inspirational leader. Josel // Listening to Bon Iver's 29 #Strafford APTS is a great way to start the work day and gets me in the "creative" mindset. Alexis // A new docu-series on Netflix called ABSTRACT. It's an inspiration because it dives into a creatives' mind and what inspires their incredible design work. Victoria // Listening to music as I work really helps me to focus and get "in the zone". Lately, my go-to is Bonobo's new album, "Migration". So how do YOU make it matter? What do you guys do to stay in the motivated, focused, and creative mindset? Time-lapses: How are they done?